Dallas, TX – The #1 All-Time Finest Set of Lincoln Cents ever assembled (according to the PCGS Registry) is being offered by Heritage Auction Galleries in their Houston Signature® Auction, the Official Auction of the Houston Money Show of the Southwest. The auction, December 4-6, 2008, includes important material from more than 230 consignors in the last major auction of the year. Some 7,000 lots include many Registry-level or Registry-leading pieces. Details can be found on the Heritage website, HA.com, where the auction is now posted; all lots are now available for inspection and bidding. "This Houston auction contains three different offerings from the Estate of Jack Lee," explained Heritage President Greg Rohan. "Most important to bidders – and to the hobby – is Jack’s #1 All-Time Finest Registry Set of Lincoln Cents, due to the importance of this series to so many American collectors. He put aside the finest Lincolns he encountered for his personal holdings, and this set resulted. We are also offering his Estate Collection, and additional coins from his inventory, all bearing the important "Ex: Jack Lee" pedigree. Jack had an incredibly keen eye, and our decades of experience mean we can confidently predict that time will only enhance the importance of the Jack Lee pedigree. Additional Jack Lee coins will be included in our January FUN Platinum Night auction and February Long Beach." "Among the magnificent gold rarities to be sold in our Houston auction," continued Rohan, "are three fascinating pieces. Lot 1968 is a 1795 $5 Small Eagle reverse, certified MS64 by NGC (Breen 1-C, Breen-6412, Bass-3034, BD-2, R.6). The 1795 half eagles were the first gold coins struck at the Philadelphia Mint, from dies prepared by Robert Scot, and this is the highest certified for this variety. Lot 2244 is an 1854-O $20 with XF details from The Deadwood Gulch Collection, described as "Cleaned" by ANACS; after the San Francisco Mint opened, New Orleans gold mintages plummeted. The 1854-O double eagle is a major rarity, with a mintage of only 3,250 coins, with 30 to 35 surviving today. Another favorite from the Deadwood Gulch Collection is Lot 2256, an 1858-O Blundered Die $20 with "AU Details." This remains a substantial rarity, unknown to many numismatists, and this is an unprecedented opportunity." "This catalog," concluded Rohan, "contains rarities across many series, but we are especially impressed with the gold rarities that this strong market is drawing out. What a great time to be a collector!" The Houston anchor collections are the Deadwood Gulch Collection; The Gene Gehrke Collection; The Eagle Harbor Collection; three selections from the Estate of Jack Lee (#1 All-Time Finest Registry Set of Lincoln Cents, Estate Collection, & Estate Inventory); The Craig Norris Collection; and The Wyoming Collection. Lot 140: 1909-S Lincoln Cent, MS67 Red PCGS. The 1909-S Lincoln is an important key-date issue among cents of the year, falling in third place behind the 1909-S Indian cent and the 1909-S VDB Lincoln cent. One of just four pieces certified as MS67 Red, none finer. From The Jack Lee Estate Lincoln Cent Registry Set. Lot 146: 1911-S Cent, MS66 Red PCGS. Due to the huge collector demand for the Lincoln cent, bidding is fierce for such Premium Gems. PCGS has graded a total of only 11 MS66 Red 1911-S cents and none in either MS66 Brown or Red and Brown (9/08). From The Jack Lee Estate Lincoln Cent Registry Set. Lot 150: 1913 Cent, MS67 Red PCGS. Although the mintage exceeded 76 million coins, PCGS has only graded four submissions as MS67 Red, with none finer. This incredible Superb Gem will nicely upgrade nearly every Registry Set. From The Jack Lee Estate Lincoln Cent Registry Set. Lot 152: 1913-S Cent MS66 Red PCGS. None of this conditionally challenging issue have been certified finer. We last offered this specimen in January 2006, as lot 3082 of The Joshua and Ally Walsh Collection of United States Cents, where it set a Heritage record for any 1913-S cent at more than $63,000. From The Jack Lee Estate Lincoln Cent Registry Set. Lot 155: 1914-S Cent, MS66 Red PCGS. With just three MS66 Red coins known to PCGS and none finer (10/08), this Red Premium Gem offers a remarkable opportunity for the Lincoln cent connoisseur. From The Jack Lee Estate Lincoln Cent Registry Set. Lot 158: 1915-S Cent MS66 Red PCGS. Ex: Tom Mershon Collection, Joshua and Ally Walsh. The San Francisco Mint’s output in 1915 spanned the denominations of the time, from the majestic $50 gold pieces struck for the Panama-Pacific International Exposition to the more humble cent. None certified finer. From The Jack Lee Estate Lincoln Cent Registry Set. Lot 160: 1916-D Cent MS66 Red PCGS. This coin represents an attractive opportunity for the discerning Lincoln cent collector. It is one of just four MS66 Red pieces in the PCGS Population Report, with none finer (10/08). From The Jack Lee Estate Lincoln Cent Registry Set. Lot 167: 1918-D 1C MS66 Red PCGS. Ex: Tom Mershon Collection, Joshua and Ally Walsh. Due to wartime exigencies, dies for the 1918-D were used well beyond their replacement time, so coins are often poorly struck and lack luster. This piece is bold, crisply struck, with exceptional eye appeal. Only one certified finer. From The Jack Lee Estate Lincoln Cent Registry Set. Lot 173: 1920-D Cent MS66 Red PCGS. With just five MS66 Red examples known to PCGS and none finer (10/08), this 1920-D cent is utterly unsurpassable, a point the Lincoln cent aficionado should remember. From The Jack Lee Estate Lincoln Cent Registry Set. Lot 174: 1920-S Cent MS65 Red PCGS. Ex: Joshua and Ally Walsh. The present Gem is well struck for this conditionally elusive issue, with obvious and inspiring eye appeal. The PCGS Gem Population figures have not changed for three years: 8 in 65, 0 finer (10/08). From The Jack Lee Estate Lincoln Cent Registry Set. Lot 178: 1922 No D Cent Strong Reverse MS63 Brown PCGS. Die Pair Two. The Philadelphia Mint coined no cents in 1922, but certain pieces coined in Denver that year lacked a mintmark. Designated as “Brown,” considerable faded orange mint luster is still visible, especially on the reverse. Only five finer. From The Jack Lee Estate Lincoln Cent Registry Set. Lot 180: 1923-S Cent MS65 Red PCGS. Above-average detail, with lustrous copper-orange surfaces and wonderful eye appeal. Conditionally rare and unsurpassed; neither NGC nor PCGS has certified a numerically finer Red representative (10/08). From The Jack Lee Estate Lincoln Cent Registry Set. Lot 181: 1924 Cent MS67 Red PCGS. At this lofty level, populations have not changed for at least three years; the combined certified population shows just five MS67 Red examples, one graded by NGC and four by PCGS, with none numerically finer (10/08). From The Jack Lee Estate Lincoln Cent Registry Set. Lot 186: 1925-S Cent MS65 Red PCGS. Ex: Joshua and Ally Walsh. The 1925-S is among the most challenging Lincoln cent issues for the high-end enthusiast. None certified finer, and available for the first time with two of the most distinguished pedigrees in Lincoln cent collecting. From The Jack Lee Estate Lincoln Cent Registry Set. Lot 189: 1926-S Cent MS65 Red PCGS. Mint State coins are few and far between; the 1926-S is one of the rarest gems in the series. PCGS and NGC each report a single example in MS65 Red with none finer (9/08). From The Joshua and Ally Walsh Collection and The Jack Lee Estate Lincoln Cent Registry Set. Lot 195: 1928-S Cent MS66 Red PCGS. Regular S Mintmark. Certified population data reveals just how rare top-tier examples are; this is one of just five MS66 Red examples graded by PCGS (10/08), and the collector who misses this opportunity may have to wait years for another. From The Jack Lee Estate Lincoln Cent Registry Set. Lot 278: 1955 1C Doubled Die Obverse MS65 Red PCGS. This is one of the great mint errors of the 20th century. Even to the naked eye the dramatic doubling of the date, motto, and LIBERTY is clear. None have been certified finer. Ex: The William Bickel Collection, Part One, and From The Jack Lee Estate Lincoln Cent Registry Set. Lot 35: 1793 Chain Cent, AMERICA, VF35 PCGS. S-3, B-4, R.3. The first coins struck at the fledgling United States Mint in Philadelphia were the Chain cents, struck in March 1793. Lot 484: 1969-S 1C Doubled Die MS63 Brown NGC. Breen-2252, FS-101. The 1969-S Doubled Die was discovered in 1970, only a few months after the coins were struck. Current population data shows that NGC and PCGS have certified a total of 36 submissions, with only seven finer. Lot 675: 1797 50C VF30 NGC. O-101a, High R.4. This 1797 O-101a specimen displays the faint diagnostic die crack from the rim through star 2 to Liberty’s curl, and is sure to elicit considerable interest among advanced collectors seeking to complete a type set of U.S. coinage. Lot 727: 1856-O 50C MS64 PCGS. WB-103. Boldly recut 56 in the date. Called R.7+ in Mint State per Randy Wiley and Bill Bugert, this is a surprisingly difficult date and variety to locate in higher grades. Lot 798: 1795 $1 Flowing Hair, Two Leaves MS61 NGC. B-1, BB-21, R.2. The blundered obverse has the 7 in the date recut over an errant 1. This is a remarkable Mint State example with a sharp and well centered impression, lustrous with pleasing surfaces. Lot 802: 1795 $1 Draped Bust, Off Center MS62 NGC. B-14, BB-51, R.2. 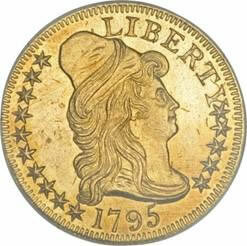 This lovely Uncentered Bust example is one of two die varieties known for the 1795 Draped Bust silver dollars. Both sides have excellent central and peripheral design details, with brilliant surfaces. Lot 854: 1836 Pattern $1, Name on Base, Judd-60 Original, Coin Alignment, Pollock-65, R.1, PR62 PCGS. Silver. Plain Edge. Die Alignment I. This is an Original Issue of 1836 with the eagle flying upward, produced during the second striking period in December 1836 after the reverse die was inadvertently scratched above the eagle’s wing. Lot 997: 1913 5C Type Two PR68 PCGS. Despite having proof surfaces commonly known as “matte,” but some authors prefer the term “satin finish.” With none certified finer, it is hard to imagine that the captivating eye appeal of this piece can be exceeded. Lot 1039: 1830 Half Dime PR65 PCGS. CAC. V-5, LM-9.1. This coin is R.4 for the variety, and probably R.7 as a proof. Although an early die state, the 1830 LM-9 half dimes were actually struck between early and late states of 1831 LM-1. Only three or four proofs of this variety are known. Lot 1166: 1916-D 10C MS65 Full Bands NGC. The entire mintage of 264,000 1916-D dimes was produced in November, after which a meeting of mint superintendents and the director, it was decided that the striking of all other denominations at Denver should be suspended until four million quarters were produced. Lot 1713: 1926 $2 1/2 Sesquicentennial MS67 NGC. Ex: Prinzi Collection. As one would expect from the grade, this is a simply exceptional example. The Population Report shows 3 in 67, with none finer. Lot 1714: 1903 Gold $1 Jefferson PR67 Star Ultra Cameo NGC. Just 100 mirror-finish proofs of the 1903 Louisiana Purchase Exposition, Jefferson obverse gold dollars were struck. Reportedly the first coins off the dies, they “… were distributed to favored insiders as well as Exposition and government officials, not to the collecting fraternity.” One of just five specimens with Ultra Cameo contrast, and this is the finest. Lot 1889: 1895 $2.50 PR67 Ultra Cameo NGC. A low-mintage date of only 119 pieces, but the Population Report problem of multiple submissions is evident — to date, the two major services have certified 125 proofs! This piece is tied for second finest certified. Lot 1973: 1802/1 $5 MS64 NGC. Breen-6440, BD-8, R.4. All 1802 half eagles are overdates, from two different obverse dies that are distinguished by the position of the 2 in relation to the drapery. The strike is quite nicely centered with complete borders on each side. Only one certified finer. Lot 1975: 1806 $5 Round Top 6, 7×6 Stars MS64 NGC. Breen-6448, BD-6, R.2. The 1806 Round Top 6 variety is conditionally rare in higher grades; NGC has certified only two finer. It is also a distinct and separate design subtype, with seven stars left and six right, unlike the earlier layout with eight stars left and five right. Lot 1989: 1837 $5 MS64 PCGS. McCloskey 2-B. The 1837 half eagle is one of the important dates in the Classic Head series, much rarer than either the 1834 or 1836. Only three certified finer. Lot 1994: 1839-C $5 MS63 NGC. A gorgeous example of this popular Charlotte half eagle, it is also enigmatic. Condition Census, efforts to plate-match the present coin with better-known examples has failed. Lot 2058: 1862 $5 PR64 Ultra Cameo NGC. The beauty and rarity of the issue cause the 1862 proof half eagle to stand out, even when surrounded by other remarkable coins. A magnificent coin and a great opportunity for the advanced collector, only two coins have been certified finer. Lot 2059: 1883 $5 PR66 Ultra Cameo NGC. This is the second finest of perhaps 20 proof 1883s surviving from an original mintage of just 61 coins. Lot 2061: 1908 $5 MS66 PCGS. CAC. Bela Lyon Pratt developed the unusual sunken Indian Head design for the quarter eagles and half eagles introduced in 1908. Only one coin has been certified finer than this amazing Premium Gem. Lot 2067: 1909-D $5 MS64 PCGS. Dropped D mintmark. This Choice coin is notable for exhibiting a rare dropped letter, in the shape of the mintmark, located above the eagle’s left (facing) shoulder. Although a rare mint error, the raised design in the Indian half eagle die encouraged clogging. Lot 2094: 1795 $10 13 Leaves XF40 PCGS. Breen-6830, Taraszka-4, BD-4, R.5. The date is widely spaced, and the 5 is close to Liberty’s bust above, but does not touch it. A visually pleasing example of this scarce die marriage from the first year of ten dollar eagle coinage. Lot 2095: 1795 $10 13 Leaves AU53 PCGS. Breen-6830, Taraszka-4, BD-4, R.5. In Early U.S. Gold Coin Varieties, A Study of Die States, 1795-1834, John Dannreuther considers the BD-4 the second rarest 13 Leaves variety behind the BD-5. Lot 2098: 1800 $10 MS61 NGC. Breen-6842, Taraszka-23, BD-1, High R.3. Only one die variety is known, with examples struck in 1800 and 1801. This wonderful Mint State piece has outstanding yellow gold luster with satiny green surfaces. Lot 2194: 1905 $10 MS67 PCGS. CAC. Only three submissions of this date have been certified MS67 by PCGS, and it is a distinct possibility that this population count actually represents only one or two specific coins. Lot 2199: 1907 $10 Wire Rim MS62 ANACS. This is one of the important rarities in the Indian eagle series. The Wire Rim and Rolled Rim varieties are both examples of the 1907 With Periods coinage, both in high relief just as Augustus Saint-Gaudens intended. From The Deadwood Gulch Collection. Lot 2200: 1907 $10 Rolled Edge MS62 PCGS. CAC. The Rolled Edge variety is also sometimes called a Rounded Rim. Lot 2220: 1920-S $10 AU58 NGC. The San Francisco Mint issued Indian eagles in 1920 and again in 1930, the final two eagles coined at the facility, and both moderately low-mintage issues. From The Deadwood Gulch Collection. Lot 2248: 1855-O $20 XF40 NGC. The New Orleans Mint produced a modest 8,000 double eagles in 1855, and survivors are few and far between in any grade, although not as rare as the 1854-O and 1856-O. Ex: Lester Merkin and John Jay Pittman, now From The Deadwood Gulch Collection. Lot 2265: 1861-O $20 AU50 PCGS. The double eagles of 1861-O were struck under the authority of the federal government, then the State of Louisiana, and finally the Confederacy. From The Deadwood Gulch Collection. Lot 2267: 1861-S $20 Paquet XF40 PCGS. Anthony Paquet, who served as assistant engraver at the Mint and as a consulting engraver during the 1850s and 1860s, created this distinctive reverse design for use at Philadelphia and San Francisco in 1861. From The Deadwood Gulch Collection. Lot 2316: 1879-O $20 XF40 NGC. Only 2,325 of these pieces were coined, representing the final New Orleans double eagle, and the only O-issue of the With Motto type. The opportunity to acquire any 1879-O is rare; in the last 15 years, we have handled less than 40 pieces. From The Deadwood Gulch Collection. Lot 2400: 1857-O $20 MS60 Prooflike NGC. Ex: S.S. Republic. In a story now well known, the S.S. Republic sank late in 1865, taking down with it a cargo of American gold and silver. This is a fascinating example of this historic O-mint issue, with amazing reflectivity and a fantastic shipwreck history. Lot 2430: 1865 $20 MS65 NGC. This is the final Type One Philadelphia Mint double eagle issue. Following the 2003 recovery of the S.S. Republic wreck, 307 1865-dated pieces emerged from the depths. A remarkably clean and attractive Gem example of this Civil War date. Lot 2477: 1879-O $20 VF35 PCGS. The only With Motto New Orleans Mint double eagle issue, and the final issue of this denomination from the southern branch mint. This is a remarkably appealing VF example. From The Gene Gehrke Collection. Lot 2478: 1879-O $20 AU58 NGC. The importance of the 1879-O twenty includes its minuscule mintage of 2,325 pieces and its status as the only New Orleans Type Three twenty. Fully struck throughout, including the reverse lettering which is often softly impressed. Lot 2586: 1907 $20 High Relief, Flat Rim MS66 PCGS. CAC. President Teddy Roosevelt demanded that the newly designed double eagle be in production by September 1st. New dies were prepared, and the relief reduced as much as possible on the Janvier lathe design. Lot 2587: 1907 $20 High Relief PR65 NGC. Proof High Relief twenties all show common characteristics: 1) Extreme sharpness in all details; 2) No die erosion; 3) Many raised die-polishing lines; 4) Uniformly satiny surfaces; and 5) A build-up of metal just inside both borders. Lot 2658: 1927-S $20 MS62 PCGS. Virtually the entire mintage of 1927-S twenties was destroyed in the 1930s, leaving perhaps 250 survivors. Lot 2661: 1851 $50 RE Humbert Fifty Dollar, 880 Thous. AU55 NGC. K-5, Low R.5. Augustus Humbert set up his assay office to refine the freshly mined California gold and create a functional medium of exchange. He arrived in California on the steamer Tennessee that sailed 20 days out of Panama. Lot 2669: Kellogg & Humbert Faceplate MS “418.92 Ounces”. Several large S.S. Central America ingots were vertically cut, with the faces saved, and the bulk of the gold converted into modern-day replicas of Territorial coins. This faceplate still weighs 35.39 ounces.